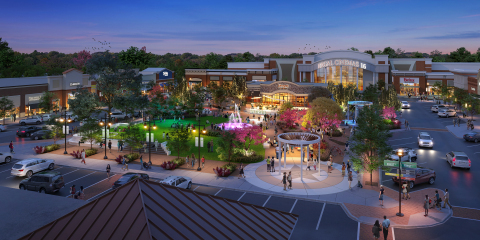 HENDERSONVILLE, Tenn.--(BUSINESS WIRE)--U.S. Properties Group, owner of The Streets of Indian Lake shopping center in Hendersonville, TN, announces the start of the construction/renovation of its prime gathering space slated for completion late spring 2019. This investment brings state-of-the-art features that today’s shopper seeks out and will see this Nashville suburb lifestyle center as the preferred destination for shopping, dining, and entertainment. The new large high-tech staging allows accommodations for larger, more prominent acts. The renovation of the central plaza space at “The Streets” will result in one of the Nashville area’s most engaging and colorful public spaces; changing seasonally with plantings and nightly with colorful interactive lighting displays. The plaza’s human scaled redesign creates a relaxed and informal space that fits today’s lifestyles. When entering the plaza, visitors can choose to walk through one of three welcoming gateway structures. Once in the plaza, multiple new pathways, defined by lush greenery and colorful flowers, meander and lead to various gathering areas where people can socialize and connect. Its informal and organic redesign allows for programmed events, such as group yoga, concerts, outdoor theater, and movie nights; while also providing an interesting and beautiful space where people will want to just hang out. Multiple seating options include moveable chairs, glowing twig benches, playful and colorful furniture elements, fixed seating planters, a seating fountain, and a green "hillside" for lounging or an afternoon picnic. The intent is to create an ambiance that uplifts and inspires those who visit The Streets and provide them a new and memorable experience each time they return. The property’s revitalization will enhance and refresh what was strategically developed more than ten years ago and will certainly be embraced by the community as the Nashville area’s premier shopping and entertainment destination! The new plaza was designed by RDL Architects from Cleveland, OH. The construction and engineering are being performed by Impact Strategies from St. Louis, IL and Mannik & Smith Group from Columbus, OH, respectively. The Streets of Indian Lake in Hendersonville, TN – Nashville North was the first and only Lifestyle Center in the 50-mile area. Conveniently located off route 65 in north Nashville, amid inviting gathering spots, wide sidewalks and convenient parking in close proximity to individual shops and eateries, The Streets offers a unique range of over 40 premium shops, spas, and restaurants, such as Sam’s Sports Grill, Victoria’s Secret, Regal Cinemas, Barnes & Noble, Bink’s Outfitters, SkinWorks Wellness & Aesthetics, Chico’s, LOFT, and much more. For more tenant information, deals and events, visit www.streetsofindianlake.com. U.S. Properties Group owns approximately three million square feet. Redeveloping shopping centers in 11 states and managing over 350 tenant relationships, USPG covers the Midwest and Southeast United States, which includes Alabama, Georgia, Illinois, Michigan, North Carolina, Ohio, Pennsylvania, South Carolina, Tennessee, and Virginia. Founded to create value and realize the “Upcycling” of shopping center assets, USPG acquires developments, renovates, and manages property to enhance values while restoring community marketplaces with best-of-class tenants and services. For more information visit www.uspginc.com. U.S. Properties Group announces the renovation of The Streets of Indian Lake prime gathering space, slated for completion in late spring 2019.